As it is not uncommon for an ocean warming to commence around Christmas, the fisherman of Peru call it El Niño, the Christ-child. El Niño occurs when the temperature of the equatorial ocean west of South America is above normal, but its effects are more widespread. Weather patterns in Indonesia and Australasia and the monsoons of southern Asia are affected, and East Africa and North America also feel its impact. The heavy rainfall of Indonesia ceases and droughts and wildfires are common in South-East Asia and Australia. Meanwhile, the mid-Pacific suffers a deluge. During El Niño, the trade winds – which normally blow towards the west – weaken, allowing warm water from the western Pacific to slosh eastwards. El Niño lasts from a few months to a year or more and occurs about twice each decade, but its period is very irregular. It is linked to a see-saw pattern in which pressure in Tahiti is high when it is low in Darwin and vice-versa. Together, this gives us ENSO, for El Niño Southern Oscillation. Sea temperatures are affected by the trade winds and in turn the winds are influenced by the sea temperature. ENSO is a two-way interaction between the ocean and atmosphere. But which comes first: warmer water or weaker winds? This is a classic “chicken and egg” problem. It can be answered by considering coupled oscillations of the atmosphere-ocean system. Left: ENSO warm phase (El Nino): Rainfall in mid-Pacific. Right: ENSO cold phase (La Nina): Rainfall in Indonesia. A conceptual description of ENSO was proposed by Jacob Bjerknes in 1969. Based on this, a simple mathematical model was devised by geoscientist Geoff Vallis, now at the University of Exeter. Vallis reduced the complex problem to just three variables, the speed of the trade winds, the temperature difference across the Pacific and the strength of the mid-ocean current. He produced three coupled non-linear differential equations for the three variables. Left: Equations of Vallis’ model. Right: the Lorenz 3-equation model. Under certain conditions, Vallis’s equations reduce to a well-studied system known as the Lorenz equations. We have an excellent understanding of how this system behaves. 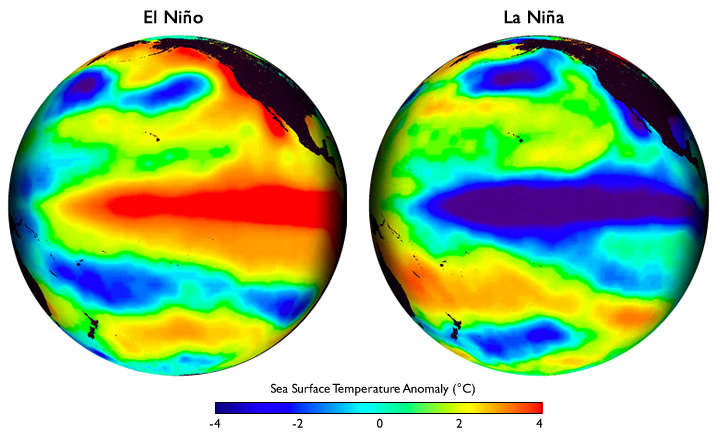 For typical parameter values, there are two distinct regimes, representing El Niño and its opposite, called La Niña. The solution switches chaotically between the two regimes. Numerical solutions of the equations show the irregular variation between the two patterns, and exhibit the main characteristic features of ENSO. What causes El Niño? In the simple model, the variations are self-sustaining: no outside influence or forcing is required to maintain them. This suggests that ENSO is an intrinsic property of the real ocean-atmosphere system, a natural variation in which the normal flow is intermittently and temporarily disturbed and more extreme conditions arise. The Vallis model is useful for understanding ENSO but it is too simple for prediction. For that, a vastly more complex and comprehensive atmosphere-ocean model is required. Currently, conditions in the Pacific are close to normal but both the European and American forecast models give a two-to-one chance that an El Niño will develop over the coming winter. While this should not affect Ireland, weather conditions in many regions may be extreme, and global temperatures could rise sharply. Vallis, G.K., 1988: Conceptual models of El Niño and the Southern Oscillation. J. Geophys. Res., 93, 13979-13991 [ Abstract ].